Imphal, March 19 2013: It has been pride of Manipur to produce many successfull international players in the field of hockey, both men and women for the Indian team and bring fame to the country. Manipur has its own history of hockey players who represent India in various international championships and help the Indian team win many tournaments. Among them, Pukhrambam Sushila Chanu from Thangmeiband Hijam Dewan Leikai is also one. Sushila who is member of the Indian Women's team is now eyeing medals in the upcoming Commonwealth games, Asian Game, Asia Cup, World Cup and even the Rio Olympics 2016 . Daughter of Pukhrambam Shyamsundar and Pukhrambam Ongbi Lata, Sushila represented India in the recently concluded World Women's Hockey League held at Major Dhyanchand Stadium from February 18 to 24 this year. India emerged champion in the league and qualified for round three of the league which is to be held in Netherlands in June. Eight countries are participating in the league out of which only six will get qualified for the Hockey World Cup. Talking to Hueiyen Lanpao in an exclusive interview at her home, Sushila said that she is putting her best efforts in becoming an Olympian and bring laurels to Manipur. She also said that she has been practising to get qualified for the World Cup. What worry Sushila is the bone fracture of her right thumb after she was hit by the ball during a match against Russia. However, doctor told her that her injury is now out of danger and she does not need worry about the injury. Employed in the Central Mumbai Railway as Junior Ticket Collector since 2010, Sushila's ultimate dream is to become an Olympian and bring laurels to her motherland. She told that she will participate in the upcoming Junior Wold Cup which is to be held in Germany in July this year. She also said that the World Cup will be her last championship in the Junior category. The 21-years-old Manipuri player has played 11 international championships as halfback since she joined the national team in 2008.She has also scored three goals in her international career. She won bronze medal in the Four Nations Hockey Championships held in Argentina in 2011. She had also won silver in Olympic Qualifying held in New Delhi in 2012, bronze in Four Nations Hockey Championships held in New Zealand in 2012 and gold medal in the recently concluded World Hockey League Round 2 held in New Delhi. She began her career as hockey player of Posterior Hockey Academy, Manipur (PHAM) in the year 2003 under coaches Ksh Romesh, W Hero and Chandi. 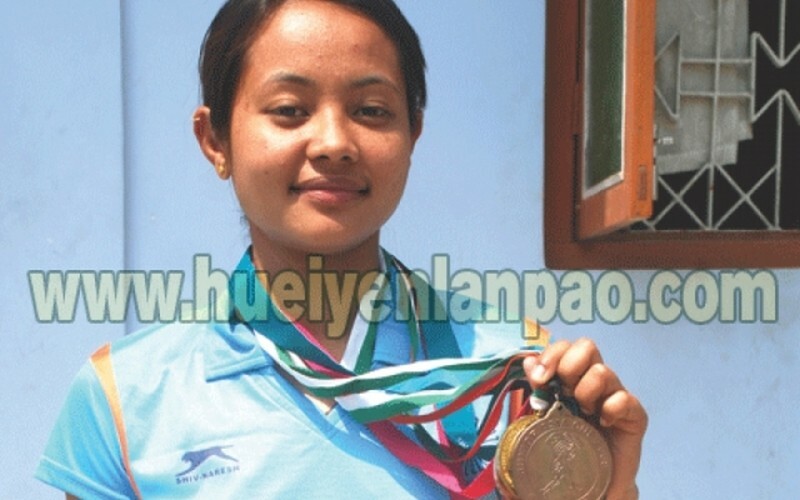 She had represented Manipur in various national championships and won many medals. Sushila who is on leave after winning the Wold Hockey League Round 2 will leave Imphal for New Delhi to participate in the national camp for the preparation of the World Hockey League Round 3 which is to be held in Rotterdam, Netherlands.